Article first published as TV Review: RUNAWAYS at Seat42F. The latest entry into the Marvel Cinematic Universe is RUNAWAYS, premiering this week on Hulu. Based on the Brian K. Vaughn (Saga) comic of the same name, and developed by Stephanie Savage and Josh Schwartz (Gossip Girl, Chuck), the show follows a group of high schoolers who, a long time ago, used to be friends. A tragic loss a year ago of one of the gang has split them apart. When they reunite one evening, witnessing their parents doing unspeakable evil brings them back together. But I’m definitely getting ahead of myself. RUNAWAYS lacks any immediate connections to the rest of the MCU, film or television series. It is the first of several new series with young protagonists, and the first for the streaming service Hulu. Without name dropping any famous heroes, though, or perhaps because of it, RUNAWAYS carves out its own time and place. Even if a few of the adults act like villainous guest stars in Agents of S.H.I.E.L.D. Like this review, RUNAWAYS takes its sweet time getting started. Over the first hour (actually, about fifty-three minutes), we are introduced to our six core teens: Alex (Rhenzy Feliz, Casual), Nico (Lyrica Okano, The Affair), Chase (Gregg Sulkin, Faking It), Karolina (Virginia Gardner, The Goldbergs), and sisters-by-adoption Molly (Allegra Acosta, 100 Things to Do Before High School) and Gert (Ariela Barer, Yo Gabba Gabba!). These peeps will have powers, but the show holds those close to its vest, instead just giving us peeks at each’s starting personality. Which we know will soon be changing because of circumstances. At the same time, as Savage and Schwartz did in Gossip Girl, the action is balanced with the ten parents of these six teens. Although the grown-ups don’t get as much development, initially among the actors portraying them are familiar faces like James Marsters (Buffy the Vampire Slayer), Ever Carradine (The Handmaid’s Tale), Annie Wersching (24), Kevin Weisman (Alias), Angel Parker (Trial & Error), Ryan Sands (The Wire), and Brigid Brannagh (Army Wives). So there’s some cred here, especially in genre TV. The thing is, though, with sixteen leads, not one of the characters is shown in any depth in the pilot. Nor is the plot really moved forward all that much, with the action not getting moving until the very end of episode one. Perhaps that is why Hulu is making three episodes available right away, before doling out the rest weekly. 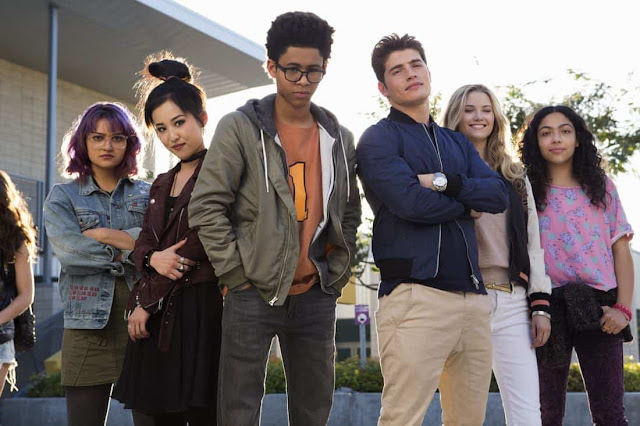 RUNAWAYS certainly needs more than a single installment to hook potential viewers. I feel like I’m being a bit vague because so is this series. The deceased member of the group, Amy, is Nico’s sister, but that’s as deep as we get into her in the first hour. We know her passing has affected the kids, and to a lesser extent, or so it seems, their parents. But other than that, we don’t know much about the mystery. We don’t know how she died or why that has created a wedge among friends. We don’t know how this past event will play into the current story. Honestly, the best scene in episode one is the one in which the parents meet shortly before their ceremony. In it, we see all their various personalities and how they clash. One wonders how the group came together at all, but clearly there is a shared, powerful purpose, a key element for groups of superheroes and supervillains in any decent series. If RUNAWAYS had more of this, I think it would be more compelling. As it is, the show isn’t bad, just slow, and seemingly unnecessarily so. I applaud the writers and producers for not rushing into the central thread too quickly and making us learn about the characters afterwards, which has unfortunately been done too many times lately. But if we’re given fifty minutes to get to know our players first, delaying the jump into the premise comic book fans are already familiar with, let’s get to know them, which I don’t feel is done very effectively. Many of the earlier scenes don’t seem like they’ll pay off later. Still, Marvel has a pretty solid track record, and this series looks to be well-made and well-cast, so I’m willing to give it the benefit of the doubt for now. Even if episodes two and three don’t quite get things moving as rapidly as I’d like following the plodding pilot. RUNAWAYS’ first three episodes are available on Hulu this Tuesday, with subsequent installments to follow weekly.